Welcome to spotlight photos that inspire part three. Photos that inspire is a series which spotlights figurine photographers who show imagination and expression in their work. Suffle is from Poland and enjoys drawing anime, playing fighting games, especially the DoA series, and of course figure photography. Suffle doesn’t really consider himself to be figure collector because he first saw Figma Konata one day on an internet shop and as a fan of the character bought it. After which he decided to bring the figure a live by taking photos and it was this that led him to purchase more figures so that he could create more enjoyable eye-catching photos. Although his collection is small he wants to get more of his favourite characters so that he can make people happy with his photos, and that is what Suffle sees as the most important reason for his figure collecting. I have followed Suffle's photography since I began checking out figure photography on Deviant Art. So Suffle was one of the first photographers who inspired me to give it a go. 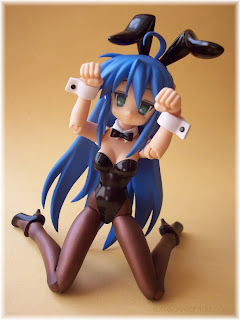 The above picture of Figma Konata with Fraulein Revoltech Haruhi's body especially inspired me to do a similar series of photos with my Fraulein Yoko. One thing that I enjoy about Suffle's work is that it is always bright and vibrant, with imagination and fun. Please check out Suffle's work at his myfigurecollection.com page and at his Deviant Art page. Jofuu is from Los Angeles and has been making arts and crafts her whole life. She recently took up photography and has become very busy with it since. She loves to experiment with different style and designs, because she loves having variety in everything she does and sees, from fashion to music and art. 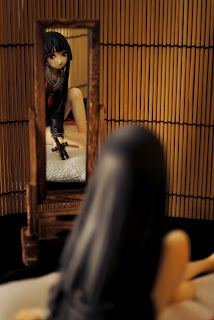 Lately she has been inspired Japanese culture, including figures. Jofuu's work drew my attention because her photo's are so colourful and vibrant, they ooze cuteness and her use of props is just great. All of her photo's are well thought out, in the use of props background, figures and lightening, making her photography stand out in the crowd. Just truly beautiful photos. Her work is truly inspirational. 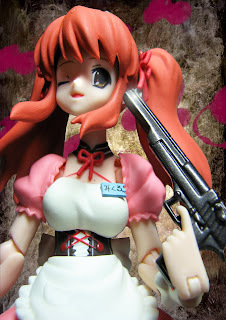 Please check out Jofuu's work at her myfigurecollection.net page or her Flickr page. 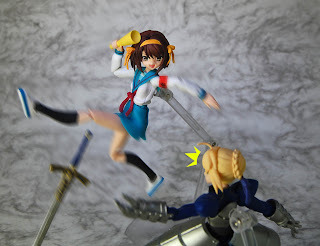 Meernebel started figure collecting in 2008, and comments that she finds it rather expensive but fun. Meernebel's first figure was Ikkitousen and for some time Meernebel only bought figures of characters she knew, but now she buys based on figure designs she likes. Now Meernebel has a passion for Nendoroids and actions figures as she loves to photograph them, as articulated figures give unlimited scope for creativity. 'You just take a camera, go out or stay indoors and play with your figures' Meernebel says. Meernebel may not have a large gallery of figure photo's, but the ones she does have are wonderful. 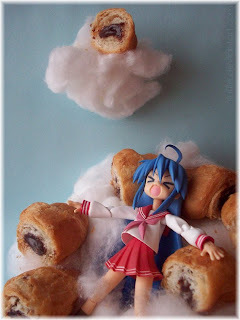 The photography skill is good and her poses are imaginative. Her photo's also have beautiful emotion in them, the picture bellow is a recent work of Meernebel's and is just so beautiful and intimate, a real glimpse into perhaps the secret lives of figures. Please check out Meernebel's work at her myfigurecollection.net page or her Deviant Art page. Then there is Toy Parade Conductor. Toy Parade Conductor is a fan of all kinds of figures from Nendoroids to Queen's Blade Revoltechs, and as an ex Art student her was fascinated by them and considers them to be works of art, and so enjoys taking photos and making drawings of figures. Toy Parade Conductor also loves dark chocolate and her pet cats. Toy Parade Conductor is a figure photographer who is really blooming, as I can see her skill and creativity in photography growing. She has her own style of lighting and choosing props which draw my attention to her work, the above picture being one of my favourites of hers, showing a beautiful and timeless photo (pardon the pun). 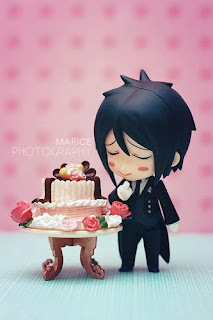 Please check out Toy Parade Conductor's work at her Deviant Art page. Wcloudxkumo is an Indonesian currently residing in Singapore, and while studying Interactive Media Design is also working as a freelance Flash programmer. 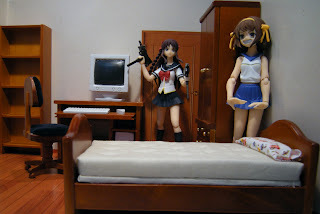 Wcloudxkumo describes himself as a typical figurine and gunpla collector. As Wcloudxkumo's figure collection grew larger he decided to post reviews on figures and so set up his own 'Mini-Studio' for photoshoots. 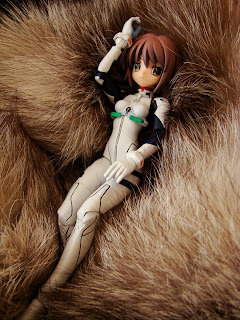 Finding photo's of Wcloudxkumo's can be a tricky business as his blog for the most part now is dedicated to providing people with up to date information on the going on's in the figure collecting world. However the ones that you can find are real gems. The above and bellow pictures are my favourites and combine great composition with fun photoshop action. They are like stills from a figure movie reel. Please check out Wcloudxkumo's work at his myfigurecollection.net or his blog Wcloudxkumo. Nyx is 24 and lives in New York and is an avid figure collector. Nyx started off with having a few figures while growing up, but never really thought of collecting as something to get seriously into, however in recent years she did just that! Nyx comments that in her opinion nothing can compare to an aesthetic and well crafted figure. Nyx has a nice collection of figures and when it comes to photography Nyx brings out the feeling of her figures through lighting and sets. The above picture is my favourite of her's because the lightening is great and the set up is wonderful, it is so beautiful and the figure looks like she is in deep thought and contemplation when you see her reflection in the mirror, just a wonderful picture. Please check out Nyx's work at her myfigurecollection.net page or her Flickr page. Wbd doesn't really consider himself to be collecting figures, but rather he buys various figures that he thinks will help with his art. After buying a few he found them pretty fun to pose for photo shoots and so now he keeps a look-out for figures with good articulation. Wbd's work first caught my eye while surfing through Deviant Art. I loved his little scenes with the miniature furniture and found the picture bellow very amusing, the expressions on the figures are just great. And so wbd made his way onto my list of photographers I watch. His work shows humor, creativity and brings life to the figures. Please check out Wbd's work at his Deviant Art page and at his blog Colony 12. Mazz66 lives in Melbourne Australia. Mazz66 got into figure collecting as follow on from her love of anime and manga. 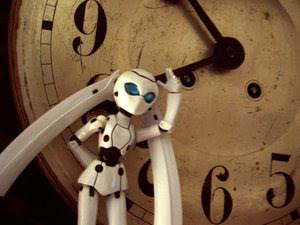 She first discovered figures through various websites such as Danny Choo, and once seeing this whole other side of anime fandom explored her local anime stores she was hooked. Figure photography for Mazz66 is a way in which she can personally capture and share the detail and beauty of figures, using sites such as Deviant Art so that other fans can appreciate and enjoy her work. Mazz66 hopes to travel to Japan someday so that she can truly immerse herself in the Japanese culture she has grown to love. 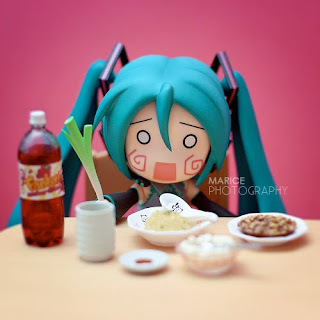 I have followed Mazz66's photography for a long time and find it delightful and fun, she has her own style and flare and by using her photoshoping skills creates lovely fun backgrounds for her figures to be placed upon. The above photo is one of my favourites of her's because it uses her photoshoping skills and has a fun and emotive picture of Mikuru, and is a real combination of what makes Mazz66's photo's worth viewing. Please check out Mazz66's work at her Deviant Art page. theNewAmAster is from the USA and is a fan of anime, star wars, star trek and video games. theNewAmAster enjoys making anything geeky and funny, whether it be a photo or a stop motion video or an amv. One thing I love about his work is his blend of genre's, the above picture is an example of that, blending The Melancholy of Haruhi Suzumiya with Star Wars to make an amusing photo. theNewAmAster's photo's never fail to put a smile on my face and so I wanted to share his fun and creativity with the wider figure community. Please check out theNewAmAster's work at his Deviant Art page and at his YouTube channel. SalemCrow is a web designer and artist who has always been into toys. SalemCrow is also a self proclaimed comic, animation, movie and toy fanatic and so venturing into figure photography was a natural progression. SalemCrow's main collection are figures from comics and movies, however while exploring a message board he came by chance across Figma's and so although he has not seen much anime he bought some Figma's because he could envision a great number of photo possibilities with them. 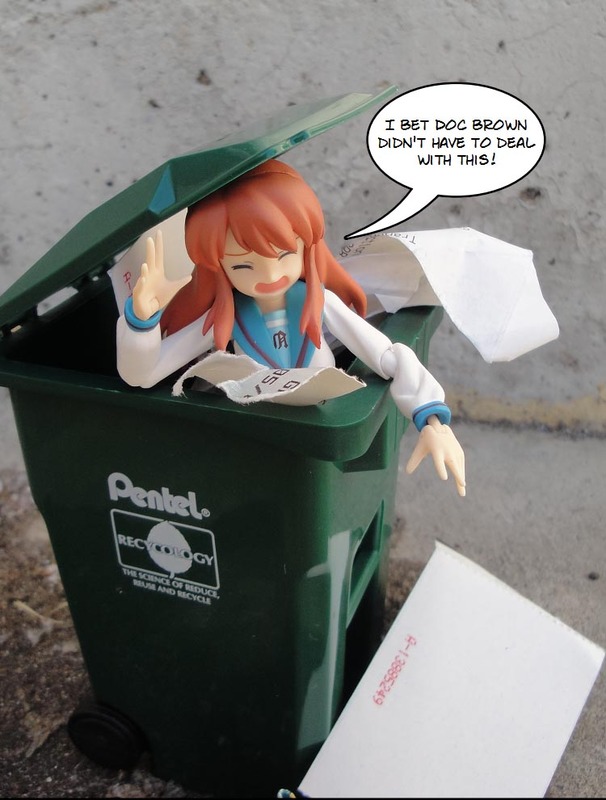 I enjoy SalemCrow's work because it is inventive and amusing, the above photo is just so hilarious yet you can't help but feel sorry for poor Mikuru. SalemCrow has a wide range of figures and uses them to create fun and nice scenes. Please check out SalemCrow's work at his Deviant Art page and his blog Darrah Designs. And last but not least Winterheimhdd. Winterheimhdd's photography has always captured my attention, his technique and photography skills are wonderful, making his photo's glow and shine, he also manages to come out with fun scenarios and scenes for his figures that make you smile. 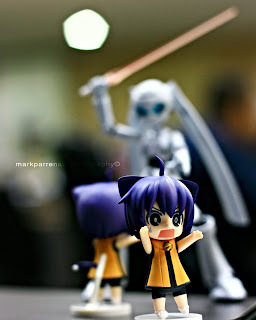 The above photo shows how his photo's glow and are very cute and funny, run little kitty's run! Please check out Winterheimhdd's work at his Deviant Art page and his blog Winterheimhdd. I hope you enjoyed the photo's as much as I do and have taken the time to view some of the artists pages. That's all for this series for now, I was hoping to show some more artists but I did not hear back from them. However watch this space more Photo's that Inspire maybe shared at a later date. The next series in the Spotlight category will be Comical Comics, where I will feature artists who have figure comics that make me giggle and laugh, so stay tuned.